In April 2011 Andipa Gallery was delighted to announce a selling exhibition of unique works and rare graphics by Joan Miro. The exhibition which took place 7 April to 7 May 2011 coincided with the first major London retrospective of Miro's work for almost 50 years, The Ladder of Escape at the Tate Modern. 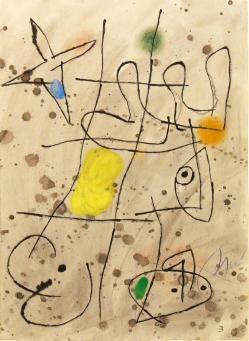 The exhibition showed rare works on paper, including some of Miro's 1965 Le Courtisan Grotesque series. Works described as displaying "the most genuine Miro, the one of the astral signs (and) symbolic objects... who uses his own mature language, without hesitations." Daniel Giralt-Miracle (art critic and historian). 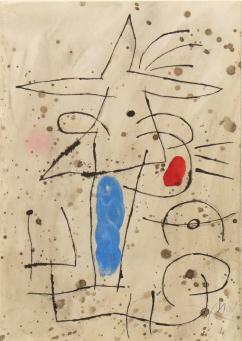 Miro's most iconic and admired engravings, lithography and etchings were also on display. 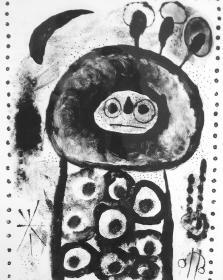 Including the original lithograph Montroig 2, named after the Catalan village to which Miro felt a deep connection, and returned to throughout his life, and which inspired some of his most seminal works. These highly sought after brightly coloured pieces make up an integral part of the artist's oeuvre and demonstrate Miro's expert use of carborundum to produce richly textural pieces that reflect the original qualities of painting. 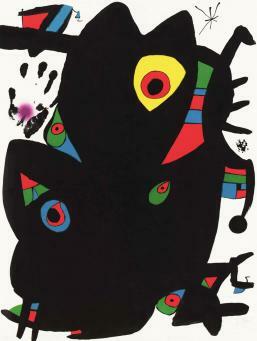 Miro was among the most prominent of modern artists, developing a unique Surrealist language that expressed freedom and energy through its fantastical imagery, vibrant use of colour and free use of paint, often splattered across his canvases creating an explosive effect. The more political side to Miro's work reflects the turbulent times of the Spanish Civil War and repression under the Franco regime. His works express and react to conflict, protest and political upheaval. In our current instable and uncertain times, perhaps this more restless and anxious aspect of Miro's practice is at its most resonant in our current era.